Charter fishing Prices on the DRIFTER TOO Fishing Boat. Drifter TOO Pricing on Fishing Charters. 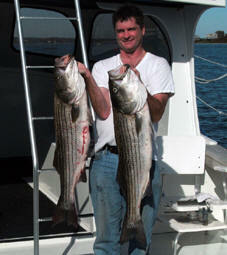 Our rates are very competitive with other 6 passenger fishing charters. We offer half day and full day trips for a variety of species. 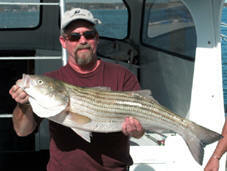 We can target Bass & Blues, Flounder, Tuna, Sharks, Scup, Tautog (Black Fish), and Sea Bass. Tuna and shark fishing trips are full day affairs usually going more than 8 hours, half days are not possible. All other species can be half day or full day affairs. Our rates run from $400 to $1200 depending on the number of people, length of time and species targeted. We can customize your trip, call us to find out the specifics. Half day trips are typically 5 hours, full day trips are typically 8 hours.